The Apprentices. Lewis Manning, Greg Beaver, Paul Edwards, Alex Cannon, Me and Amy Kirby. During my absence from blog writing, I began looking at internal vacancies within Rathbones to secure a permanent job. There were a number of vacancies that were circulated internally which, after some research into them, I didn't feel matched what I was looking for. I didn't want to apply for a position just to be made permanent. I was willing to wait until I felt a good opportunity came up. I wanted to work in a team that has a wide range of responsibilities to prevent the work from becoming repetitive. Luckily, an email about a vacant role on the Provider Business Support team was circulated to everyone in the office. After speaking to various employees throughout the company about the role, including the manager, I decided to go for it. I was offered an interview for a Friday morning. I had studied the job description and thought of as many questions as I could think of that related to the role. This allowed me to prepare several examples for each aspect of the job. I was also lucky that the experienced I had gained throughout the apprenticeship meant I had a decent understanding of some of the tasks performed by the department. I felt the interview went as well as it could have gone. There were no questions I couldn't provide an answer for. The interview was also only supposed to last an hour and we exceeded that by half an hour - which I thought was a good sign! I was expecting to find out whether I was successful by the following Monday but received a phone call the same day and found out the good news then - result! This team is exactly what I was looking for, in terms of a wide range of responsibilities. Provider Business Support are the contact point for Self Invested Personal Pensions and Offshore Bond providers. Running and distributing various reports, ensure any ad hoc requests are met and maintaining a good relationship between the advisors are all amongst our responsibilities. I have since settled in perfectly and the team are great. I am really enjoying this position. Apologies for my lack of blogs as of late. Things have been very eventful and so much has happened! First things first, I am currently writing this blog from the main office of the Chartered Institute for Securities and Investments in London! The reason for this is due to me recently securing a role as the first ever CISI Apprenticeships Ambassador - not too shabby! The position basically allows me to represent the CISI and contribute to the services they provide in working with employers to promote apprenticeships. My role will require me to give presentations at events to give my view and tell my experiences about apprenticeships. These presentations could range from being delivered to students deciding between an apprenticeship and university, to employers who could potentially take on apprentices. This means I have a great opportunity to speak to a vast scope of audiences. This week is my first week of this new post and it has already seen me travel to London, give a presentation about my apprenticeship experience and meet the entire CISI team. Later on this week I will be required to travel back home to Liverpool and give another presentation in the Liver Building. This week has already proved to be a very busy one but a very exciting one at the same time and I am very much looking forward to see what being the CISI Apprenticeship Ambassador entails in the forthcoming months! As I mentioned in my previous entry, the apprentices and I were scheduled to visit the Rathbones office in London. On Thursday 5th February, we did just that. My alarm had to be set for 6 o’clock, which would allow me to be on the 07:47am train and in the office for 10:30am. When we got there, I was very impressed by the location to say the least! We were given a tour around the office by HR representatives. I couldn’t believe how client orientated the office was, with nearly an entire floor dedicated to meeting rooms. Next on the agenda was a meeting with Hugh Adlington, who is an Investment Manager who has line management responsibilities for other investment management terms and also chairs the Strategic Asset Allocation committee. It was a really good opportunity to hear more about what he does, as well as asking him questions about the different tasks he is faced with, the pressures he is under and how he finds the right balance between his different responsibilities. After that, the apprentices were split into two groups and my group had presentations from Mark Smith, Manager of Middle Office London, and Matt Hawkins, RPAS Financial Planning Director. As Mark was originally from Liverpool and moved down to London and I saw the opportunity to ask him about moving to the capital. He expressed that it is a bit of a culture shock at first due to the hectic public transport but you soon get used to it. This response meant that I'm not ruling out a future move to London to further my career if any opportunities arise further on down the line. We then had a chat with RIM Management Committee. The chat was relatively informal and there was a relaxed atmosphere. It allowed us to meet many senior figures from the company. I noticed how fascinated many of them were with the apprenticeship scheme and how successful it has been so far. They were also very interested in what we had to say about the scheme, which was a good chance to voice our opinions. The afternoon consisted of a tour around ‘Financial London’. This was very informative and was a great way of seeing how business in London started and progressed. We started by finding out how shares in companies, commodities and insurance all started in three coffee shops located in (Ex)Change Alley. We then moved on to seeing the head offices of some of the biggest organisations in London before finishing the tour outside the Bank of England. The day then unfortunately came to an end, leaving us to make our way back to Euston to catch our 5:00pm train back to Lime Street. I believe the day overall was a huge success! I hope I get the opportunity to visit the London office at some point in the near future. I hope everyone has had a great start to 2015 and I’d like to wish you all the best for the year ahead. It is really surprising how fast the time is flying. When I started my apprenticeship, I had no idea how fast it would go. Two years sounds a lot longer than it actually is! Knowing that I only have around 8 months left on my apprenticeship is unbelievable. My main focus for this year is to secure a permanent position for after my apprenticeship, as well as continuing to complete my IOC exams. Speaking of my exam, I spoke about studying for my first exam. I have since sat the exam, just before Christmas, and honestly felt that I'd done everything I could to fully prepare myself for it. The exam was an Introduction to Securities and Investments. It gives me great pleasure, as well as relief, to inform you that I passed! I was so happy. After the exam, I had a short break from studying while I enjoyed my festive period. The break was short lived as before I knew it, I had the books to my second exam and I am currently working through the material. The other apprentices and I are scheduled to visit the London office in early February. I have liaised closely with colleagues in the London office to organise the visit. The aim was to gain a better insight into the departments that are only based in London. The apprentices and I had drawn up a plan for what we'd like to do when we were in London. Some ideas included meeting with the RIM Management Committee as well as fund managers and financial advisors, as well as visiting the RUTM and marketing departments. When we had outlined an agenda, I then went back and forth with HR and a company secretary to arrange a plan and overcoming setbacks. When in London, we will also get an opportunity to have a guided tour of the city, which is an opportunity that doesn't arise every day! I will give you another update to tell you how it went after we go. Well, a lot has happened since my previous blog! First things first, I have passed my NVQ! I needed to pass this in order for me to complete the first stage of the academic side to my apprenticeship. This means I am now officially have a Level 3 Advanced Business & Administration National Vocational Qualification. My portfolio was assessed and I received compliments for how obvious it was that I had taken a great level of ownership with my work. This came as a massive relief, along with a great sense of pride. I have since begun studying for my first IOC. This is the second stage of the academic side to my apprenticeship. As it is the first time I have had to study in over a year, I found it a little tricky in getting back into the swing of it. Now that the studying is well under way, I am really enjoying it! I often find myself struggling to put the book down. I have yet to book my exam as I want to be 100% ready and confident going into it, but I will keep you updated when I do. Also since my last blog, I have started my third department. I am now the Dividend Apprentice. I am working in the offshore part of Dividends, which I am really pleased about. It is the first opportunity I've had to work with any offshore element to Rathbones and my knowledge has increased greatly as a result of it. I am currently processing equity's and will eventually move onto processing unit trusts, as they are far more complex. I believe it won’t be long before I'm in a competent position within Dividends and I look forward to being in such a position. I am now nearing the one year mark in my apprenticeship. With only one month left until I have reached the half way point, I now have one or two tasks to do before my NVQ is completed. I have found it very interesting and I have gained a lot of vital knowledge from it. My knowledge of the workplace has improved greatly, such as why certain tasks are performed and how the workplace functions. The NVQ has opened my eyes to what is expected from employees and how the best can be brought out of an organisation. I believe the NVQ has helped me settle into the work place a lot easier by giving me a great understanding of it and I will be able to use the valuable skills learned down my career oath with me. It now won't be long before I begin my studies for the IOC exams. I am really looking forward to learning more about the financial industry. I believe working at Rathbones for a year has put me on a great starting block. This is due to my everyday tasks and the questions I have asked to my colleagues always allowing me to find out more. I have also been receiving emails from the CISI each day with a question that I could expect in my exams. When you complete the question it then explains the answer in full. I understand that there is still a huge amount that I don't know about the financial markets but I can't wait to find out more. I am also in the middle of organising a visit to the London office for myself and the other apprentices. This visit will give us an insight into the role the London office plays in the operation of Rathbones. It will also allow us to meet our colleagues and see what the London office has that the Liverpool office hasn't. It would be ideal if I can bring some ideas back from London that I can suggest we introduce into our office. There are some departments in Rathbones that are only based in London so it I'll give us a chance to get to know more about them. I am also hoping to get an insight of what it is like to work in London, as this is something I would be open to in the future if the right opportunity arose. I love Liverpool, the city I currently live in, but moving away in order to seize a great opportunity is something I would definitely consider. By visiting the London office, I hope to experience firsthand what it would be like working there. I was recently invited to attend the CISI Liverpool & North Wales Annual Dinner that was being held at the Crown Plaza in Liverpool, on 22nd May 2014. The dress code for the dinnerwas black tie which meant I had a chance to dust down my dinner suit and clip on my dickie bow! As the majority of attendees would all be working in the financial industry, I seen it as a great opportunity to network and get to know more about working in the industry. The CISI Dinner would give me a fantastic opportunity to meet people who currently do similar jobs to what I would like to do in the future, as well as represent Rathbones. This was too good of an opportunity to turn down. This and the fact that the guest speaker was Kevin Keegan. As I'm a big red, the chance to meet a Liverpool legend was a no brainer! I was sat on a table with the other apprentices, along with people from different companies. We were all in conversation from people from various other businesses. It was great to get an idea of the different jobs and routes people have taken in the financial industry to get to where they are today. It took me by surprise that the people I spoke to were very easy to speak to and took the time to listen to what I, the apprentice, had to say. This opened my eyes that people of a high stature in the industry are just people, like everyone else, who have worked hard and taken the chances they have been given. The dinner has helped me realise that I am no different to anyone else that was sitting in that room. It has opened my eyes to what I am capable of achieving. As the Rathbonesapprenticeship is a great way for me to be introduced to the financial industry, it is down to me to take this starting platform and continue the progression after the apprenticeship is finished, and I am very confident in doing so. During the dinner, numerous members of the CISI gave presentations and our apprenticeship actually received quite a significant mention. It was good to know that people outside of Rathbones are appreciating the success of the apprenticeship so far. I think it may have opened other companies eyes to starting similar schemes, as the attending company representatives were made aware of our progress. I think a few where quite impressed! Overall, the meal was a huge success! I met some big figures in the financial industry. 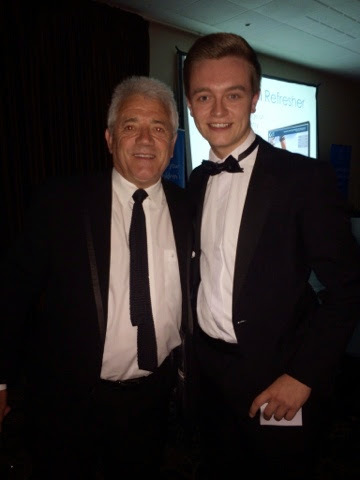 I had a chat with Kevin Keegan about Liverpool’s most recent season and how we will progress from there. This was followed up by a photo and an autograph, obviously. I am now very much looking forward to next years dinner. Liverpool is the birthplace of Rathbones. The Rathbone family history dates as far back as 1669 and the name has been synonymous with Liverpool ever since. While operating as a local team, our Liverpool office is part of one of the UK’s largest wealth management firms Rathbones is part of Rathbone Brothers Plc, which has a listing on the London Stock Exchange. The CISI is pleased to support Rathbones' apprenticeships and is delighted that its Investment Operations Certificate (IOC) is available through the investment administration strand of the Level 3 Providing Financial Services Advanced Apprenticeship.